New York City’s most consequential mayors were all builders. Fiorello La Guardia presided over a massive build-out of the city’s infrastructure, paid for by federal New Deal dollars. Robert Wagner developed a huge amount of public housing. Ed Koch and Michael Bloomberg nurtured private construction while engineering the creation of tens of thousands of units of subsidized housing. Each of these mayors served three terms, the only people in city history to do so; together, they ran the city for 48 of the last 84 years. Three of those men are dead, but daily life in the city still occurs in and on their physical legacies. Three and a half years into that plan, 77,651 units of subsidized housing have been created or preserved. De Blasio also engineered a record-low 1 percent increase in the rents on the city’s 1 million rent-stabilized apartments in 2014, followed by two years in which rents weren’t increased at all. He launched a plan to bolster the cash-strapped public housing authority (NYCHA) and save New York’s 176,000 public-housing apartments. The mayor also spent record sums to fund legal services for tenants facing eviction and then agreed to create a right to counsel for low-income people facing eviction in housing court. He created a suite of new voucher programs targeted toward people in homeless shelters, moving 60,000 into permanent housing. And, for the first time in city history, he imposed a “mandatory inclusionary housing” requirement, forcing developers who take advantage of zoning changes to devote a portion of their buildings for specific income groups. But the city’s housing crisis continues. More than 60,000 people, including 23,000 children, slept in city homeless shelters this week. Half of renter households pay more than 30 percent of their income in rent, the threshold of affordability; more than 28 percent of renters pay more than 50 percent of their income in rent, making them “extremely rent burdened.” Rates of housing code violations and severe overcrowding have ticked up. 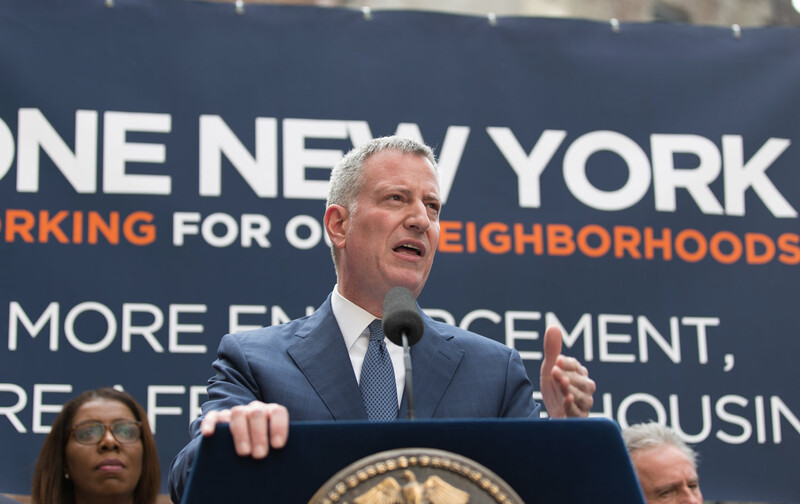 That helps explain why, two days after de Blasio swept to victory in the Democratic primary last month, advocates were in front of City Hall alleging that the progressive mayor’s affordable-housing plan is neither progressive nor affordable. “Despite the constant self-congratulatory press conferences announcing progress toward the 200,000 goal his plan does not include nearly enough apartments at the lower income tiers—where the affordability crisis is most acute and most painful,” read a September 14 report by Real Affordability for All, a coalition of advocacy and tenant groups. Nor was skepticism about the de Blasio housing plan confined to the steps of City Hall. Inside, Councilmembers grilled the mayor’s housing officials on whether the mayor’s plan is serving the families who most need help. Meanwhile, uptown in Harlem, Manhattan Borough President Gale Brewer has joined with the local community board to reject a proposal by the mayor to rezone East Harlem because they worry that it will displace low-income people. Along Jerome Avenue in the Bronx, organizations representing low-income communities of color have organized fiercely against a similar de Blasio plan. While de Blasio has progressive critics on his policing policies, it’s fair to say that the fiercest criticism of de Blasio from the left concerns his housing and rezoning plans. The mounting degree of disagreement is striking, all the more so because it is growing starker even as the mayor closes in on an easy reelection victory. The increasingly tense exchanges between Bill de Blasio and some housing advocates are not just a case of pressure groups moving the goal posts, or of wonks wrestling over the minutiae of policy. It reflects deeper disagreements over the responsibilities of government during a crisis and the role of the market in solving a problem it created. Some de Blasio’s accomplishments in this field cannot be dismissed. Even in the depths of the Great Recession, Bloomberg’s rent regulators hiked stabilized rents year after year in total disregard for the city’s obligation to balance the needs of tenants and landlords. De Blasio’s move to freeze rents not only saved tenants money, but it also prevented thousands of units from going over the rent threshold at which apartments exit the regulated system. Meanwhile, his homeless-housing vouchers responded to one of the signal policy errors of his predecessor, which was to discontinue a similar program after a funding dispute with the state. And while the City Council had to push de Blasio to establish a right to counsel in housing court, the mayor clearly was already moving in that direction; now that he’s gotten there, low-income New Yorkers can, for the first time, expect a basic element of fairness and due process in courthouses where the trajectory of poor people’s lives is often decided. Give the mayor this, too: Housing policy in New York is a complex, costly beast. It involves subsidies and tax breaks, lotteries and vouchers, for-profit and nonprofit developers, federal tax credits and state rent regulations, environmental reviews and community boards, and separate city departments overseeing the zoning, building, and maintenance of residential buildings. It also involves a cast of interest groups—from landlords and banks to tenant advocates, landmark preservationists, and unions—that form alliances one moment and take opposite sides the next. Moreover, the deterioration of working people’s wages and the appeal of New York real estate to international elites looking for investment opportunities create inherently unjust dynamics in the city—especially in neighborhoods whose residents didn’t need to read The Power Broker to hone an understandable distrust of big ideas meant to “improve” their communities. What’s more, the steady retreat of the federal government from its historic role of supporting cities means the mayor is missing one of the most powerful levers to adjust this imbalance. So, yeah, mayors face no simple choices when they take up housing policy. But they do have choices. Some of de Blasio’s have been enlightened and decent. In two important ways, however, he has leaned toward being a far more conventional politician than his 2013 “Tale of Two Cities” campaign suggested he would be, or as the times demand. One is the way de Blasio has divvied up the housing under his plan so that it serves a broad range of income groups, from the desperately poor to the comfortably middle class. The mayor’s 2014 plan aimed to devote 20 percent of the units created to households making less than $43,000 for a family of three. It set aside a larger 22 percent to families making $69,000 to $137,000 for a family of three—meaning the plan could serve households in the city’s top 20 percent of incomes. This is where the mayor and advocates disagree over a government’s responsibility. Is it to help everyone a little, or to assist the most desperate people as much as you can? To its credit, the de Blasio administration has responded to some of the criticism of its plans. It has opened the door to experimenting with community land trusts, which would keep land used for affordable housing in nonprofit status, so that it doesn’t get sold off for high-rent living when regulatory agreements lapse in 20 or 30 years. It’s making more of an effort to work with nonprofit developers, who aren’t a panacea but do have an existential commitment to affordability. And the mayor has increased the number of low-income units in his plan from 40,000 to 50,000, from 20 percent of the total to 25 percent, a move that cost just shy of $2 billion. But the commitment to build housing for households earning six-figures remains. Were the de Blasio housing program revised to tilt more towards lower-income people, it would almost certainly mean creating fewer units of housing—because it costs the city more to subsidize construction and operation of housing when the tenants make less money and pay smaller rents. De Blasio’s 200,000-unit goal is politically potent, because it is more than Bloomberg produced and probably about what Koch generated. Yet many housing activists say that missing the target would not bother them all that much. They say that the 200,000-unit goal, while symbolically powerful, has little intrinsic value. In fact, they think the desire to hit the goal reflects another misstep in the de Blasio housing strategy: the effort to encourage market-based housing construction under the theory that new housing—any new housing—will help ease the housing crunch and, with it, the upward pressure on rents. It’s this idea that drove the mayor to ally himself with the Real Estate Board of New York, the lobbying group for developers, to propose modest reforms to a lucrative tax break on housing construction that has produced very little affordable housing over four decades. And it’s why de Blasio is aiming to rezone a dozen neighborhoods for new residential density. After all, New York City’s population growth (about 14 percent from 1999 through 2014, according to the triennial federal Housing and Vacancy Survey) has outpaced growth in the housing stock (about 9 percent over the same period, per the HVS). But the housing market is not a simple meeting of local supply and demand. Some of the demand for New York City housing has nothing to do with the size of the city’s population: The New York Times in 2014 found that on some midtown blocks half or more of the apartments were vacant 10 months of the year because they are the second (or third or fourth) homes of wealthy world citizens. And sometimes supply can create demand. The construction of new housing serving higher incomes can have a broader effect on a neighborhood, triggering changes in local retail and in market rents that lead to displacement of lower-income people. The link between rezoning and gentrification is not conclusively proven but it is a risk, and under the de Blasio housing plan, low-income communities of color are the ones that are primarily being exposed to it. The discussion over these policy approaches is loud in New York, but the arguments playing out there are not exclusive to this city. In Atlanta, mayoral candidates debate whether the answer to the affordable-housing problem is more density or anti-displacement regulations. In New Orleans, outgoing Mayor Mitch Landrieu imposed inclusionary zoning to address soaring rents, but the crisis continues, and those vying to succeed him have debated what role Airbnb plays in the problem. Chicago is experimenting with making it mandatory for developers to build affordable housing. And as recently as September 14, California legislators approved a suite of bills aimed at boosting residential construction and creating new funds for affordable housing. Even in Jackson, Wyoming, it’s an issue. 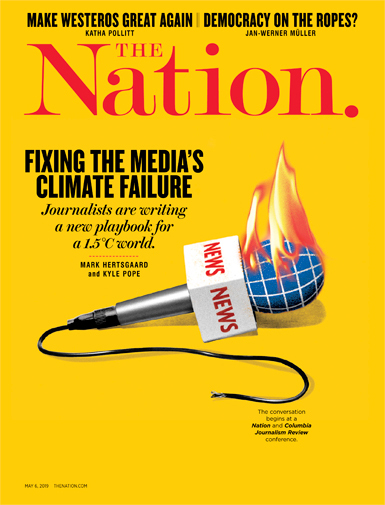 “Though the solution to Jackson’s housing crisis is widely considered to be greater density, where, how much and which regulations should apply is still being debated,” the local newspaper, Jackson Hole News & Guide, reported in September. The question advocates raise is whether de Blasio needs to sing along as much as he has chosen to. A powerful set of interests—from developers to buildings-trade unions—benefits from development of any kind in New York, and some of those interests have been generous donors to de Blasio’s campaigns. Some of the mayor’s critics believe he needs to resist the “build, baby, build” mantra altogether. Others believe that, while the City should add housing, City Hall must drive a much harder bargain with private developers and strike a balance far more in favor of the poor in the housing built with public subsidies. As excellent new biographies by Juan Gonzalez and Joseph Viteritti make clear, De Blasio has been an extremely effective mayor. He and his team demonstrated so much political skill and managerial acumen that implementing a massive pre-K program looked easy, but it was a tremendous achievement. It was not the only one. Settling dozens of labor contracts that Mayor Bloomberg had let fester, creating new benefits for workers, reducing the jail population, expanding the ferry system, launching a municipal ID card, ending the city’s absurdly expensive outsourcing of massive IT projects—these policies have improved hundreds of thousands of lives. It’s not been perfect, but there has been real progress on many fronts. Housing will continue to be the mayor’s greatest challenge if he wins a second term in November, as seems very likely. The test won’t be whether de Blasio will solve the problem; it’s too big for one mayor or one city to solve, whether New York tries to subsidize its way out of the crisis or build its way out, whether it aims for 200,000 units or 20,000. The mayor faces political limitations—among them, a Republican State Senate in Albany and a hostile federal government—and legal constraints. City Hall, for instance, has tried on two occasions to develop a policy to tax “pied à terre” apartments, but backed away because recent case law indicated any such tax would not survive an inevitable legal challenge. So the test will be how de Blasio applies the limited resources and authority he has. That could mean skewing the housing plan more—maybe exclusively—toward the poorest households, even if that requires tilting his program toward preserving more apartments and constructing fewer new ones, even if it means a smaller plan altogether. The mayor could also suspend the neighborhood-focused rezonings in favor of more citywide measures to absorb new density and protect tenants. The mayor has already proposed a “mansion tax” on high-end real-estate deals to pay for more senior housing, and he’ll be pushed to consider other taxes to nudge vacant buildings and land onto the market. Instead of merely experimenting with community land trusts, the city could commit to them fully. He could also support ways to strengthen rent regulations if the state legislature goes along. There is no single idea that will sweep the problems away. But there are ways de Blasio can move his housing policy to align more faithfully with his very sharp critique of the housing market. Being mayor in a crisis is inevitably about blocking and tackling. It’s not glamorous, but it’s the stuff legacies are made of.